Pistachios are native to the Middle East with trees growing in Iran, Syria, Turkey, Egypt, Lebanon and a handful of other countries. Frequently roasted and salted, they're great for snacking but are also common ingredients in desserts such as Pistachio Baklava and or coatings such as Pistachio Crusted Rack of Lamb. 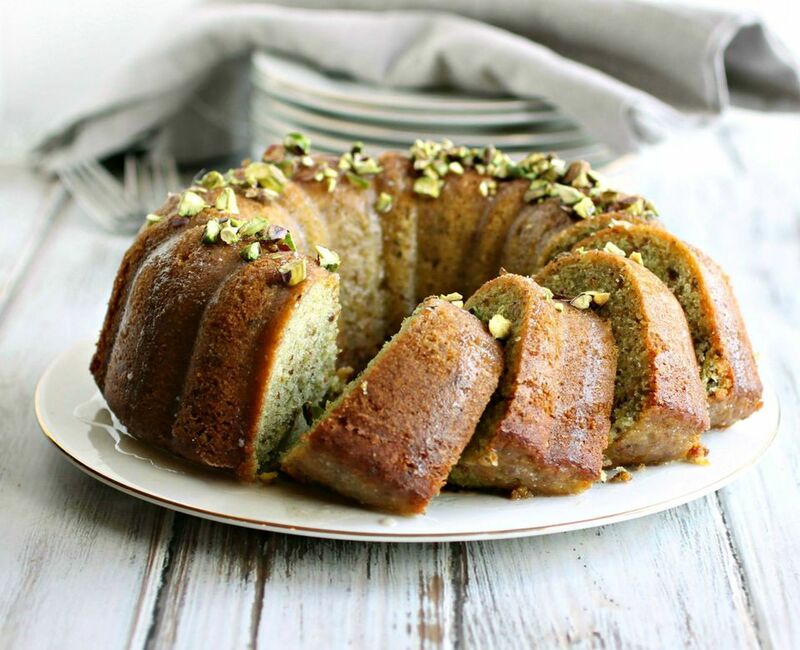 This cake gets its flavor and texture from grinding up pistachios into a grainy flour. Although pistachios do have a natural green tint, most commercial pistachio flavored foods have added green food color to give them a deeper hue. You can serve this cake just dusted with powdered sugar or with a plain powdered sugar and milk glaze. But a dash of cardamom adds an interesting spice and aroma to this dessert treat. Just brew a pot of tea and enjoy! Pre-heat the oven to 350 degrees and butter and flour a bundt or tube style pan. Using a hand or stand mixer, beat together the eggs and sugar until lightened in color. Beat in the butter, vanilla and yogurt. Stir in the food coloring, if using. In a separate bowl, sift together the flour, ground pistachios, baking powder, baking soda and salt. Beat the dry ingredients into the wet and pour the batter into the prepared pan. Bake for 50 - 55 minutes or until a toothpick comes out clean. Make the glaze by whisking together the powdered sugar, milk, cardamom and salt until smooth. Drizzle over the cooled cake and sprinkle on some additional chopped pistachios, if desired.